Narrators: Elizabeth Bower, Ben Elliot, Nicola Stanton, Steven France. 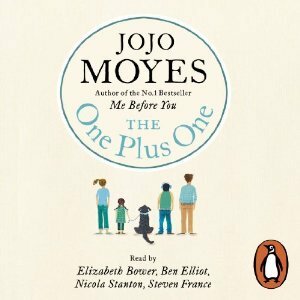 This is my first book ever by Jojo Moyes and I believe it was a good introduction. I thoroughly enjoyed this audiobook. I mainly listen to audiobooks while walking, this book had me talking out loud to the characters, smiling at the world and discreetly wiping away some tears. This is probably the first time I have listened to a book with four narrators, the book tells the story from the point of view of four characters- Jess, Nicky, Tanzie and Ed. After a few moments of discomfort these narrators became the characters, and I am sure that they totally enhanced this book for me. I give them all top marks for bringing these characters alive in my imagination. Jess is an amazing woman, she has a husband who has deserted any sense of responsibility and disappeared, she has little money but works hard to support her small mismatched family. Money problems dog her much of the way, at one point she makes an error of judgement, however the way she handles that had me applauding her. She is a great mother and Nicky and Tanzie are very fortunate to have her. I also loved how the children Nicky and Tanzie were very much part of this story with their challenges of growing up and being their true selves. Norman the dog completes the family, and does he come to the party when it really matters - you bet! Big and slobbery but well loved and included in the family. Ed is almost against his will in the beginning sucked up into this family when he joins them to help them take a step to help Tanzie achieve a dream. They take a car journey together across country which turns out to be no picnic but all the same things happen! Loved the way Ed helped Nicky and Tanzie. A heart warming emotional read, where honesty, family, personal growth and change and small kindnesses stand out. I keep on hearing about this author. Glad to know she is a good author. I have to check if my library has any of her books. As I said this was my first one and I did enjoy it! You never know when you try new authors if you will like it or not. Not too emotional actually but touching more like it. It was very HEA and great single mom read. Great review Kathryn! I loved this novel. I read it, but it sounds like it was just as good, if not better through audio. Yes Pat, remember reading your review, it made me make One Plus One my very next listen! I haven't read anything by her, and I have two or three books on my shelf. GREAT it was good for you. I need to get reading!! Elizabeth I have some books on my shelf too of hers, so I need to read them too, but may not be for awhile as so many others!! The summary scares me a little. It doesn't sound like from your review that anything major happens in the book because I am seriously worried about the new guy in the mix. I'm trying to get into audio books so this might be a good one for me. I don't know about the four narrators part - Is it actually four different people or one person narrating? Adriana nothing terrible happens in the book, but lots go on! I am trying not to give the plot away! I loved it, there were four different narrators and they were all great - in my opinion. I think the key would be if you like this genre, or prefer something else. If you are getting into audiobooks I would choose something in a genre you love and see what other people say about the narration first because narrators make all the difference. Oh this sounds awesome and I am addicted to audio at the moment.